Pork and apples are a winning combination, and this apple butter glazed pork rib recipe takes full advantage of that great pairing of flavors. Spare ribs are the intended recipient of this apple butter treatment, but if you'd prefer to make this recipe with baby back ribs (or even country style ribs), go for it! The glaze and bbq sauce go well with just about any cut of pork. What The Heck is Apple Butter? When you combine apples, a bit of sugar, a variety of spices, heat, and time, you'll end up with either apple sauce, or apple butter. When the apples are cooked just to the point of being very soft and mushy you've got apple sauce. But when the cooking time is extended, the sauce thickens and the sugars begin to carmelize, transforming the sauce into a thick, buttery-textured, deep brown and richly flavored apple concentrate... otherwise known as apple butter. 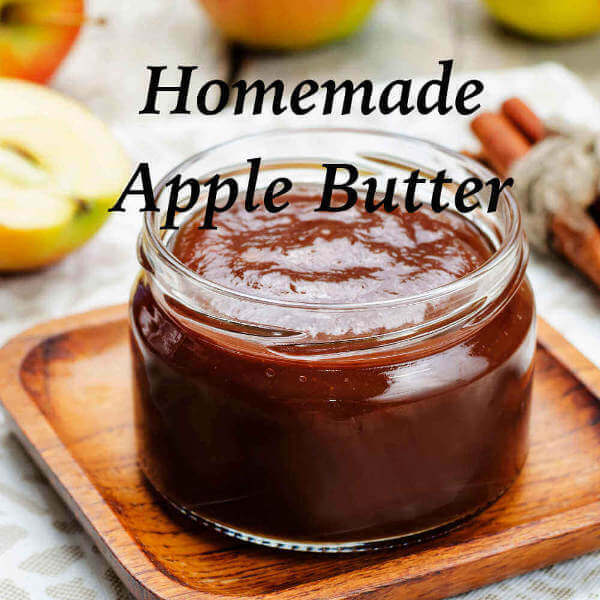 Because of its high sugar content from the concentrated apple pulp and added sweeteners, apple butter keeps extremely well and has a long shelf life. Whenever your apple tree has a bumper-crop year, making a big pot of apple butter is a great way to store those apples in a much more compact form. And if you're curious, there's no dairy butter in the ingredient list. It's called a butter because of its smooth, spreadable consistency. Other than using apple butter as the primary flavor ingredient, this is just a standard smoked rib recipe. After trimming the rack of ribs, they're salted, coated with apple butter, seasoned with a spice rub and smoked. When the ribs are close to being done, the ribs are brushed a few times with a bit of diluted bbq sauce, which thickens as the ribs finish cooking, creating a great looking, great tasting glaze. The apple butter bbq sauce is made with just a few common ingredients, and requires just a short simmer to blend the flavors. The main ingredient is, of course, apple butter, which is combined with a smaller amount of tomato based barbecue sauce. A few more ingredients are added before the sauce is brought to a light boil, then cooled. In the grocery store, apple butter is usually found alongside the jams and jellies. Some stores may only have a couple of different types available, while at others you'll see several fancy gourmet varieties. Another option is to use your own homemade apple butter. Maybe you already have some on hand. Or maybe you'd like to try making a batch of apple butter yourself for the first time. You can make it with fresh apples, or easier yet, unsweetened apple sauce from the store. Do a quick search online and you'll find tons of apple butter recipes to choose from. Remove the membrane from the bone side of the ribs if it's still intact. Season both sides of the ribs with the kosher salt. Rub one tablespoon of apple butter onto each side of the slab. Combine the remaining dry ingredients and coat the spare rib slab evenly with the rub mixture. 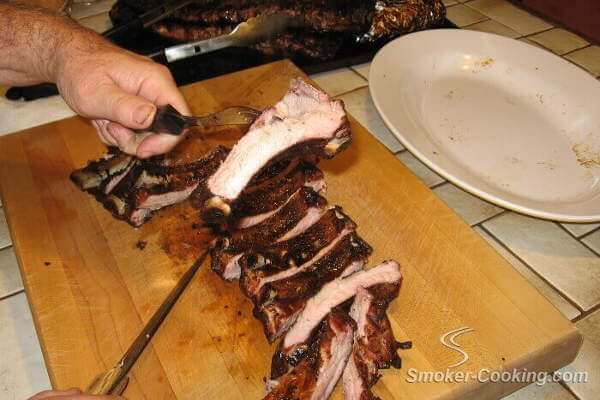 Place the ribs into your smoker, with the cooking temperature set somewhere in the 225˚ to 240˚ F range. Hickory or apple wood are a couple of good smoker wood choices. Combine the bbq sauce ingredients in a sauce pan. Bring to a simmer over medium heat, and cook for 5 minutes. Cover the pan and remove from heat to cool. Combine 1/2 cup of the apple butter bbq sauce with apple juice. Use this to baste the ribs when they're close to being done. Brush on several thin coats, separated by 10 minute cooking intervals, which will thicken the glaze. Remove the ribs from the smoker when done and serve, with your apple butter bbq sauce on the side. Any of the standard side dishes will go along well with your apple butter glazed ribs. Baked beans, potato salad, cole slaw and grilled veggies are all good choices. Provide some sliced bread and iced tea, and you've got a great meal. And you might consider having apple pie for dessert!